Did you know that a number of Amish call Maine home? Among the handful of settlements in the Pine Tree State are the Amish at Unity, Maine (Waldo County), an atypical group for several reasons. Everything I’ve heard about this community suggests it’s a nice little place with a few businesses and which seems to be quite friendly to outsiders (that of course is not what makes it unusual). 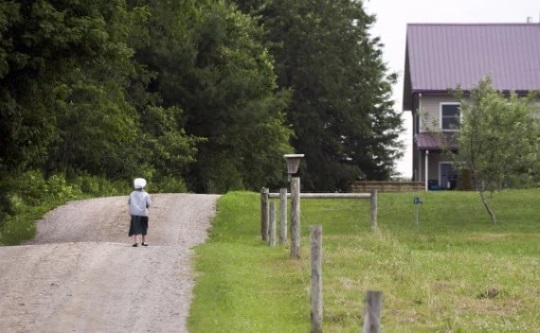 While they might not be treated as a curiosity, the Amish at Unity have some practices that arouse the curiosity of outsiders and other Amish alike. The meetinghouse apparently also serves as a school. Though these innovations could be considered progressive, one custom that they apparently have that’s similar to more conservative Amish: they prefer not to work away from home (as is typical for Amish construction crews in many places). What is at the root of the unusual church practices? One possible answer: according to one of our readers, Unity has connections to the unusual experimental (and now-defunct) church group known as the Christian Communities (Cookeville, TN). Led by Elmo Stoll, an Amish bishop described by G.C. Waldrep as “charismatic”, “well-respected”, and “influential,” the group was meant to be seeker-friendly but technologically very plain. Services were held in English, community of goods was practiced, and the group drew many spiritual seekers, before eventually disbanding (you can read about this and other atypical “Amishesque” communities in G.C. Waldrep’s “The New Order Amish and Para-Amish Groups” in the July 2008 Mennonite Quarterly Review). Unity is not this far off from Amish norms, but apparently Stoll’s family is among the members at Unity so some influence likely remains. The reason I’m mentioning the Amish at Unity today is because they were recently featured in a Bangor Daily News article. The bulk of the piece is an interview with Caleb Stoll, a minister who made the move to Unity from Ontario in 2008, the year the settlement was founded. It’s unclear whether Caleb Stoll is related to Elmo Stoll, but it seems quite possible given this suggestion. The community is not large, at between 15 and 20 families in size. It includes some converts (Stoll was in fact meeting with a potential convert the day the interview was done). Amish at another Maine settlement, Smyrna, “sponsored” Stoll’s family (I assume this has to do with immigration from Canada), and asked them to settle within 150 miles. Stoll sees the Amish as enjoying “a wave of popularity” over the past 20 years, which he fears may lead to an inflated self-opinion. Donuts made and sold on Wednesdays and Saturdays at Unity’s Community Market are a hit with outsiders, coming in a grab-bag of flavors like pumpkin cake, chocolate cream, and jelly. While Amish have enjoyed popularity in Waldo County (with its Common Ground Fair described as “ground zero for the state’s hippies and homesteaders alike”) Stoll’s comments remind readers of typical Amish stances–against popular movements for gay rights and assisted suicide. Maine is still the only state in New England with Amish, but it has seen the occasional new settlement added over the past decade-and-a-half. All of Maine’s communities except for Unity are found in Aroostook County, Maine’s northernmost, and the largest county east of the Rockies (larger than three states). These include the conservative Swartzentruber Fort Fairfield community, at least two communities founded since Unity, as well as the state’s oldest settlement at Smyrna. Caleb Stoll is Elmo’s oldest son. Thanks for confirming he’s a son Katie, that was my guess. Erik, I met several folks from the Unity and Smyrna settlements at the 2015 Anabaptist Identity Conference in Nappanee. Actually, the first person I met when I entered the building was a man, of English background, from Maine. I didn’t think he was Amish, due to his mustache, and was confused when he didn’t salute me (I am a member of the Old German Baptist Brethren, New Conference and we generally use the Holy Kiss with other groups that would do the same). He informed me that most Maine Amish wear mustaches. During the conference, I learned that these two settlements are very seeker-friendly, and I believe it is Smyrna that even uses English in worship services. I did meet an Amish family from Northern Indiana that planned to move there in part due to the use of English. There is a definite connection to the now-defunct Christian Communities and Aaron Stoll’s continuation of their vision at Caneyville (I think in Kentucky). Aaron is a son to Elmo, and cousin to Ira Wagler, author of “Growing Up Amish.” Ira’s blog has three entries about Elmo Stoll and the Christian Communities. Given that I am most acquainted with the Amish of Allen County, IN and Northern Indiana, where I have friends, this group did seem very atypical to me. They seem to have a solid vision and dedication to this expression of Christianity. What I found very encouraging is the willingness to accommodate seekers. A minister friend from our area did get to visit with one of the members from Maine, and would probably know more about it than I do. If there are any questions for him, I would be happy to ask. Thanks for this interesting background info, Nicholas. You reminded me of a video of Kenneth Copp of Living Grains demonstrating a horse-powered flour grinder, and in the video he does have a mustache. Sounds like if that’s standard there then it’s another unusual-for-Amish practice to add to the list. I believe I’ve read one or two of Ira’s posts on Elmo Stoll. Ira’s a great writer. I’ve found Elmo Stoll’s writings in Family Life and elsewhere interesting as well. Any other info you come across and feel like sharing here is certainly welcome. The Elizabeth that I have mentioned elsewhere in this post is Elizabeth Stoll, widow of Elmo. I see her and several of her married children at least once a week. At her granddaughter’s wedding in May, I got to meet Elmo’s brother and his wife. This was a very interesting article. I would love to visit the area, in the Summer. LOL. I am a Florida girl and do not do well in the cold. I wish there were more Amish settlements in the South but land prices are what probably keeps them North of the Mason Dixon. I know many people stay North, because of the high heat in summer and not having AC. I know it would get to me. 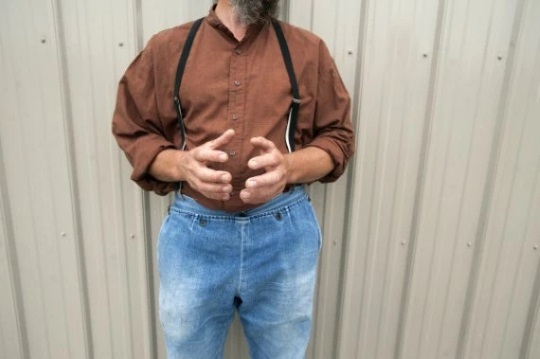 There is a community of very-conservative Amish in Mississippi. I am one of the drivers for the Unity Community, and have been since 2009. I value their friendship. This recent article in the Bangor News is very good. I will make copies of it for them. If anyone has questions about Unity, I can probably answer most of them. Technology in the Unity settlement? Neat that you commented here Joan, I recognized your name from the comments in the previous Unity post. Since you mentioned it, I was wondering if you could generally describe what sort of technology is used here. From some things I’ve heard it seems it might be quite plain in that regard, but I also read about an air-powered mixer in the article we linked here. Erik- This Old Order Community is rather plain that way. The telephones are in sheds quite a distance from the houses, even at the Community Market/store. The lighting in the Community is propane or battery. They do use air power to run the generator to run the milking equipment on the dairies and generators for their washing machines, the old wringer type. I am not very up on the generators and how they work, but heard air being released the other night when it was powering a mixer. No radio, TV or computers at all, tho’ occasionally someone will call me to look up something on my computer, like the date of an auction. I have also once or twice ordered books from Amazon for them because Amazon will not take phone orders. Weird that Amazon will not take phone orders. They use bicycles and buggies to get around the local area, and drives to go more than 8 or 9 miles, to shopping or the doctors in Bangor or Waterville. The Community is 2 to 3 miles from the shops in Unity, so they use bikes and buggies to get there. Hope this helps. Thanks for this info Joan and picture of technology use in the area. And I know what you mean about helping out with Amazon orders, I recently did one myself for some friends in Lancaster–Bible story books 🙂 I did not know they don’t do anything over the phone. This posting left me with a smile 🙂 on my face! This sounds like a place I’d enjoy visiting, if only because English translators are used—I’d love to know what an Amish sermon sounds like—in both languages. The meetinghouse concept is unusual, but I could see how well it would fit into a budding community. It’s also unusual to hear how they welcome “seekers”—not the usual in Amish communities in general, as I understand. Thanks for this virtual visit to an unusual Amish community! Those potatoes really come out shiny and clean, don’t they. That was neat to see. I’d appreciate a translation as well. Live translation is a challenging job though probably made easier by familiarity with the subject matter. Rich Stevick has described the community at Pearisburg, VA also doing this for outsiders. The update on the sermons in Unity and Hodgdon is that they are now all in English except for very rare occassions because so many in those communities do not speak PA Dutch or German. Even the most recent wedding was all in English, partly because some of the groom’s family was English. I am not sure about the sermons in Smyrna, tho’ I can ask Elizabeth. The hymns are still in German in Unity for the church Sundays and weddings, and there are Engl;ish translations for those that need them, like me. There are some very skilled translators available when English is not used. One wedding we had a few years ago, the translators were in teams that switched every 1/2 hour or so. When a lot of the service is in German, the non German people sit in a group at the back and the translators talk softly so as to not disturb the service. The reason Unity has a meetinghouse as opposed to meeting in homes is that most of the houses are not big enough for lots of people, and the barns and sheds are not heated except when necessary, tho’ we did have the most recent wedding in May in a very large building that they normally make minibsrns in. There were 430 people there. The youth Sunday evening singings are in peoples’ homes. Wow, very interesting info Joan. There must be a lot of converts in the community to do things mostly in English. Any idea how many of the 15-20 families they mention might be in the convert category? And do you have any more info on Hodgdon–it is a daughter community of Unity? I assume a bit smaller? Thanks! Erik- One of the families that moved to Unity about a year ago was a Mennonite family from Newport that has 8 children and does not speak PA Dutch or German. A large family that moved to Hodgdon several years ago also did not. There are maybe 3 families in Unity that do not speak or understand much except English but only 2 are converts from Mennonite. Most of the families in Unity still teach their children PA Dutch/ German before English. It is quite a challenge for me to converse with their small children. There are maybe 8 or 10 families now in Hodgdon, and it is an offshoot of both Smyrna and Unity. It is 17 miles from Smyrna. No idea how many families there besides that one only use English. When there are visiting ministers that are not comfortable with doing services in English, then they use German and translators. My Great Grandmother married outside the Amish Church and moved to California a long time before I was born. My Grandmother married a Pentecostal Minister and they were our legal guardians and raised us most of our growing up years. We visited my Great Grandmother very often and watched her live the Amish Culture and Religion. She taught us well and I am now living the culture in my older years and would be very interested in attending service there on Sundays. I live in Columbia Falls which is about 2 hours away from Unity but do have a driver that can bring me so I am interested in learning the time for service. My Pennsylvania Dutch and German are somewhat limited and am so happy to learn they welcome seekers and have service in English. Peel Potatoes in one minute! I guess you haven’t yet seen the videos on YouTube of people peeling literally an entire bag of potatoes in less than a minute–all you need is a power drill with a new toilet brush head for the “bit”, a bucket, a hose, and the potatoes. I wasn’t sure if linking directly was okay, but if you go to youtube.com and search for “man peeling potatoes with drill”, all the videos that come up are exactly this sort of thing. I think it’s such a hoot. 🙂 The “Denmark style” one is my favorite. Erik- I took one of the farmers to deliver some strawberries this afternoon, and asked him about how things work, and said I was a bit numb about how things run. Hopefully what he said will clarify my earlier post on this. I am posting from his notes so apologize if there is any confusion. I told him he may get another phone call from me if this is not clear. Water is pumped by compressed air to the pump in the well. The air is compressed by a gasoline driven compressor and stored in an old propane tank. Water is on demand at the tap in the house until air pressure is low, then the pressure is built up again. Household appliances are run by hand crank or sometimes a bread mixer or blender is converted to air and run with an adapter. Solar panels charge batteries in some houses. Batteries run electric fences for livestock. The washing machine I mentioned earlier is run by a gas motor like one from a lawnmower. Caleb’s milking machine is run by vacuum. A vacuum pump can also be driven by a gasoline or diesel engine. The cow barn gutter cleaner is run by hydraulics which is run by the same engine that powers the vacuum pump. Thanks Joan for the extra details. It sounds like it might not be as technologically plain as I originally thought, but still many things common in other Amish communities. It just dawned on me that what I just posted might look odd to some people. The only reason I am driving a man is with his wife’s knowledge and permission. We have been good friends since 2009. I am in my 70s so am no threat to anyone. Mostly men hire men drivers, and women drive women and especially young ones. In a community this small I’m wondering what is done about young people marrying and starting families. Do they marry cousins, which would lead to the possibility of children being born with genetic disorders ? Do they marry someone from another Amish community nearby in the hopes that the couple would take up residence in Unity? I wondered about this as I read this post so thought I would ask. Between Unity, Smyrna, and Hodgdon, there are plenty of families that are not related. They are not marrying cousins. There are also like minded communities in several other states that these Amish visit and sometimes marry into. The new couple often chooses to live in the groom’s community because often he has already established a business or farm before the wedding. This FB page, originally started by me at Katie Copp’s request for her bakery. She was Mennonite and has gone back to being Mennonite. She moved back to PA, and the bakery moved into the Community market. The Unity ministry knows I maintain this page, and it does help promote their various items. Many thanks for the details on Ervin’s WindPressor business. I should have included that in my earlier post on technology. And thanks for the link to the previous Bangor News article. I’ll toss in that Ervin’s oldest son Joas has a bicycle repair business, too.